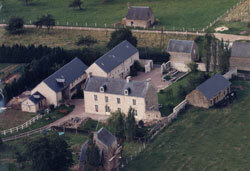 Easily accessible, the "Asinerie du Bocage" is located in Villy-Bocage, a small countryside village surrounded by woodland, near the Villers-Bocage exit off the A84 motorway link between Caen and Rennes. The undulating area, criss-crossed by foot paths allows for pleasant excursions with our pack donkeys. 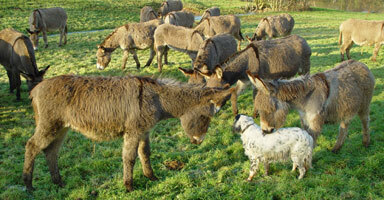 The asinery has approximately 35 donkeys of Cotentin breeding who enjoy life together as a group in our green meadows, as well as the company of our dog "Mascotte" who pays regular visits to them.. They come and go freely to their stables where they are protected from the rain and hot sun. 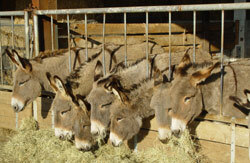 They also enjoy the extra hay given to them and the fresh water they get from an auto drinking water trough..